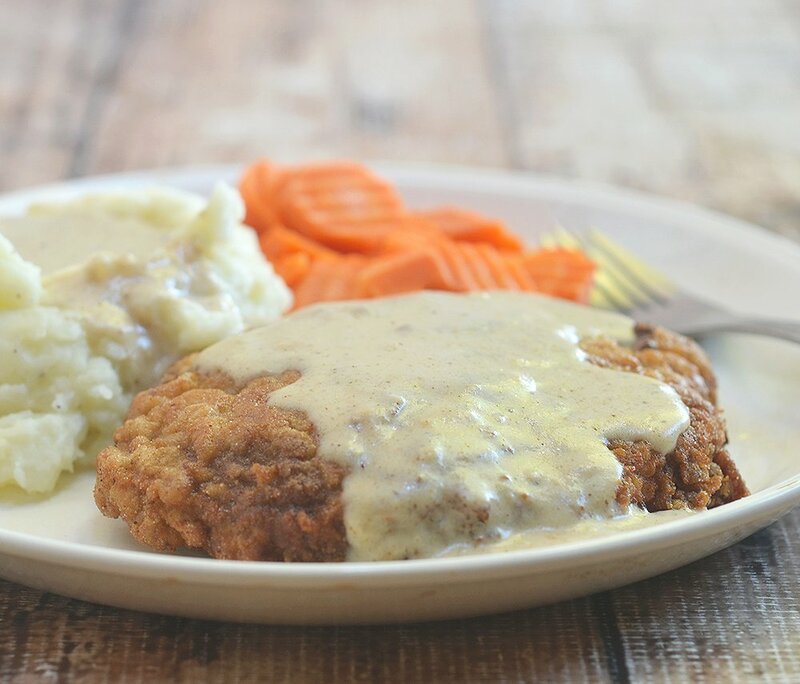 Country Fried Steak with Creamy Gravy made crispy, super tender and tasty using a buttermilk marinade. Hearty and delicious with a flavorful milk gravy, it is the ultimate comfort food. 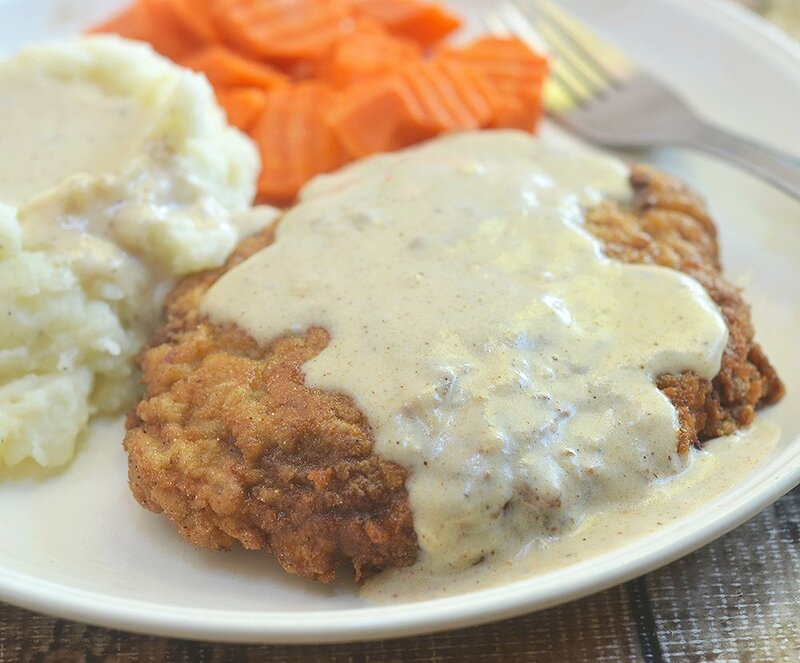 While I am not really big on beef and am more of a fish-and-chicken kind of gal, I am seriously obsessed with country fried steak. It’s what I order 99% of the time when we go out to eat at family-style diners and is one of the dishes on regular rotation I make at least once a week at home. I just love how the crispy pan-fried cutlet drenched in a flavorful milk gravy goes so well with sunny side up eggs and buttered toast for breakfast yet equally amazing with a side of fluffy mashed potatoes and steamed veggies for lunch or dinner. Hearty and delicious, it’s pure comfort food! 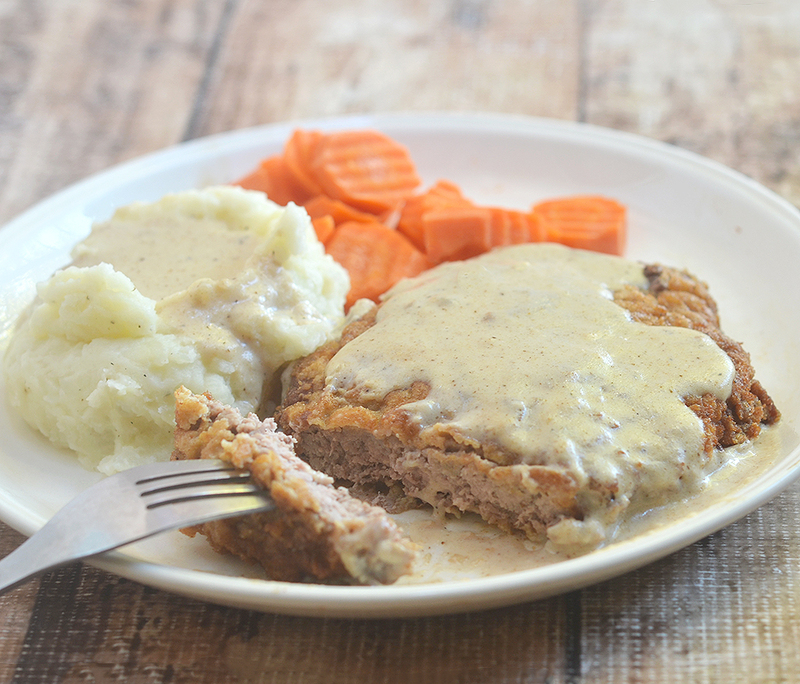 Country fried steak with cream gravy is a household favorite for good reason. Not only does it make for a tasty, satisfying meal, it’s also budget friendly using cheaper cuts of beef. 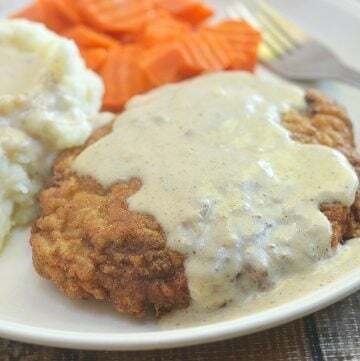 Although you can use thin slices of top round, top sirloin or any tougher primal cuts for this chicken fried steak recipe, I like to skip the pounding and flattening the meat myself and opt for cube steaks that have already been mechanically processed and tenderized at the butcher shop. Dinner means less work and is ready in minutes! Pound the cube steaks further with a meat mallet, if you can, to flatten to about 1/4 inch thick. This will speed up cooking and allow them to finish in the time it takes to brown and crisp the breading. Marinate the beef in buttermilk for at least 4 hours or overnight for best results. This keeps the meat moist and flavorful. 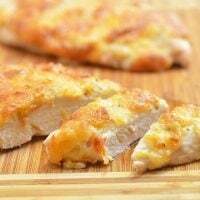 Use a mixture of flour, corn starch and baking powder for a light and crisp breading. Allow the prepared steaks to rest for a few minutes on a wire rack before frying so the coating will adhere better. Use enough oil to deep-fry the breaded cutlets. Heat the oil to the optimal range of 350 F to 375 F, making sure not to overcrowd the pan. Place each steak on a flat working surface and using a meat mallet, pound until about 1/4-inch thick. In a bowl, combine cube steaks and the buttermilk. Marinate in the refrigerator for about 2 to 4 hours. Drain well, reserving 1/4 cup of the buttermilk. Pat the cube steaks dry and season with salt and pepper to taste. In a shallow plate, combine flour, corn starch, baking powder, salt, garlic powder, onion powder, paprika, pepper, and cayenne pepper. In a shallow baking dish, combine egg and the reserved 1/4 cup buttermilk and whisk until blended. Working with one steak at a time, dredge in flour mixture, dip into egg mixture and then in the flour mixture again until fully coated. Arrange breaded steaks in a single layer on a wire rack and let stand for about 3 to 5 minutes. Reserve 2 tablespoons of the flour mixture. 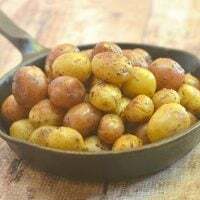 In a cast iron skillet or thick-bottomed pan over medium heat, heat about 1/2- inch deep of oil to 350 F (until the oil is shimmering but not smoking). Add steaks one at a time into the hot oil and fry for about 2 to 3 minutes on each side or until or until golden brown and cooked through. Remove from pan and drain excess oil on a wire rack. Keep warm and proceed with making the cream gravy. Remove oil from pan leaving about 2 tablespoons of pan drippings. Over medium heat, sprinkle the reserved 2 tablespoons flour over the drippings and whisk until smooth. Continue to cook, stirring regularly, for about 1 to 2 minutes or until golden. 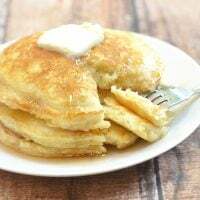 Slowly add milk, whisking vigorously and scraping loose browned bits from the bottom and sides of skillet. Cook, stirring regularly, for about 1 to 2 minutes or until slightly thickened. Season with salt to taste and generously with pepper. Serve hot over country fried steaks. There’s also a new kitchen device – Fast Cutlet Maker V2. It flattens the meat and create a cube pattern on it. It’s popular in Germany. 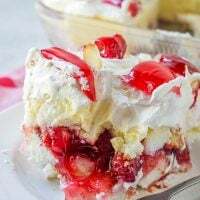 This recipe looks like the one I remember from my childhood. 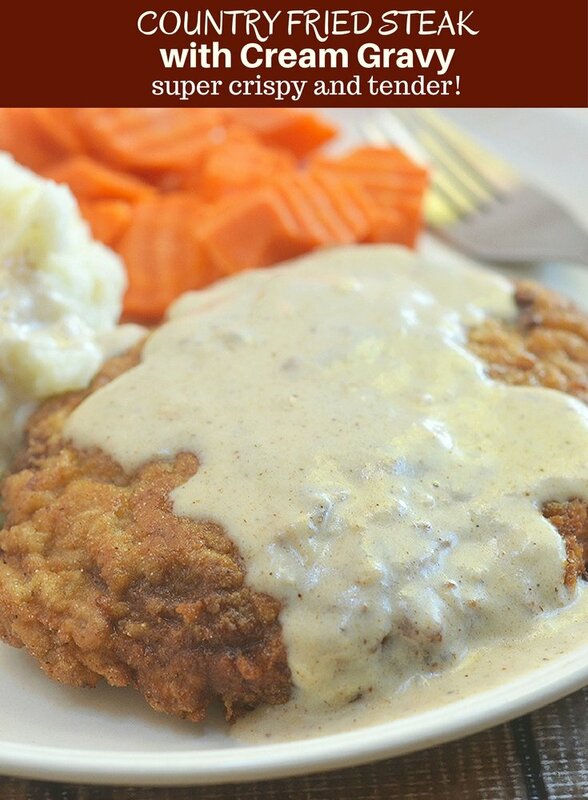 Love me some country fried steak! I am sorry the recipe didn’t turn out well for you. This is a favorite in my house and always had good results. May I ask, please, if you followed the tips I provided? It really helps for the batter to adhere better if you let the breaded cutlets rest before frying. Using enough oil and making sure it’s at the optimal temperature is also important.